As you may already know, I've been accidentally collecting more MIDI Keyboard controllers than I ever wished for. Buying new, not selling the old because there's always an excuse use for it. 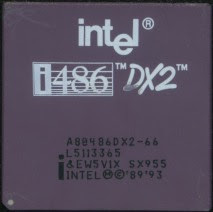 It all started when I bought my (really mine) first "real" (as opposed to my Sinclair ZX Spectrum) Personal Computer (I had used PCs for a while at this point: 8086, i286, i386sx, i386 based, but none were mine), a brand new D-I-Y i486DX2@66MHz based PC with (at the time) 4Mb (a few years after, upgraded to 32Mb) of RAM. It had a Creative Labs Sound Blaster 16 because I've always hoped to use a PC to generate sound through synthesis using math (i.e. DSP algoritms), besides taking advantage of the digital sampling/playing capabilities that PCs started to have at the time, through these new, more capable, audio card interfaces. 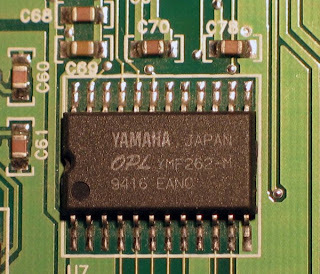 I was all excited also because it included a true FM synthesis chip, the Yamaha OPL-3. This turned out to be a little disappointing, when soon realizing that it was too weak for any interesting, more elaborate and complex synthesis that I was hoping to do with it. My plan was to buy a cheap, 2nd hand MIDI controller, and also take advantage of the MIDI-Game port cable adapter, and use that card as my FM synth, while learning more about how to program that card's sound DA chips to generate non-sampled based sound and build a CPU+RAM based synth instead of using hardware based synth chips for that. Long story short, it was with that i486 that I discovered Trackers and the TraxScene underground culture, usually considered as a support scene for the more flashy and important DemoScene. Well... because of Trackers, I basically stopped "wasting" my spare time, learning how to deal with audio card (DSP) programming and started using what was available to be as creative as I could with what was already available. Through Hornet's DemoNews I also learned about the "wars" between SoundBlaster compatible cards and Gravis UltraSound type of hardware assisted sample playing cards. GUS had better performance with low CPU usage because of the built-in sample memory vs the SB cards that had no sample memory restrictions but taxed the CPU a lot because of sample data being transfered from the main memory. This was also why it was possible to send DSP generated audio instead of just sampled one... and to me, this was what kept the SoundBlaster way a lot more interesting than the GUS way. Not having to pre-load the samples into the card's built-in memory was what made possible the soon to be known as soft-synthesis (exactly what I wanted to do with my SB16 from the start but didn't realize that it wasn't as easy as I thought... at least with pre-Pentium CPUs). I remember my first tracker was the smallest I could download from Ants'Nest BBS, a local BBS related to a nearby Demoscene group, Radioactive Design. The Internet was still miles away from happening to me, although I already knew about FTP servers and Telnet gateways into IRC channels, when reading some of the articles and even IRC logs (!?) that where published on DemoNews, Hornet's DemoScene-related text based (eZine like) newsletter I started reading at this time. I think it was also responsible for my sudden interest on Trackers and all the Scene. TraxWeekly became my main newsletter/eZine, since it was solely TraxScene oriented. After understanding how a Tracker worked and how to use it, I searched for the best, most advanced one I could find that could run with my PC's SB16 audio card. Found Psi's Scream Tracker after downloading Future Crew's Unreal demo and becoming interested in that Demo group. Quickly changed to ST3 and started making .S3M mods, inspired by what Skaven, Purple Motion, and others were releasing at the time. I also tried Triton's Fast Tracker a bit later, but I was already hooked on the Scream's UI and shortcut commands, so... I kept using Scream Tracker until I tried its historic successor, Pulse's Impulse Tracker. It was around this time that I finally saw this weird, very cheap, 4 octave mini-keyboard that had a true MIDI output plug at the back. It was perfect to use with IT's MIDI support. So I bought it and this allowed me to record more natural sounding (i.e. playing) sequences, recorded in real-time instead of step-sequenced. ...and this was how I got my first MIDI Controller Keyboard: Trust mini MIDI Keyboard. The same I still use with Record+Reason, through the Remote Codecs I released a while back, mainly for Dr.REX control, since it's not velocity-sensitive, it's still perfect for that. EDIT: Thought of adding here this PH video (released 2013/07/16) featuring Adam Fielding due to how appropriate it is to this old post.